A DIFFERENT KIND OF PIZZERIA! 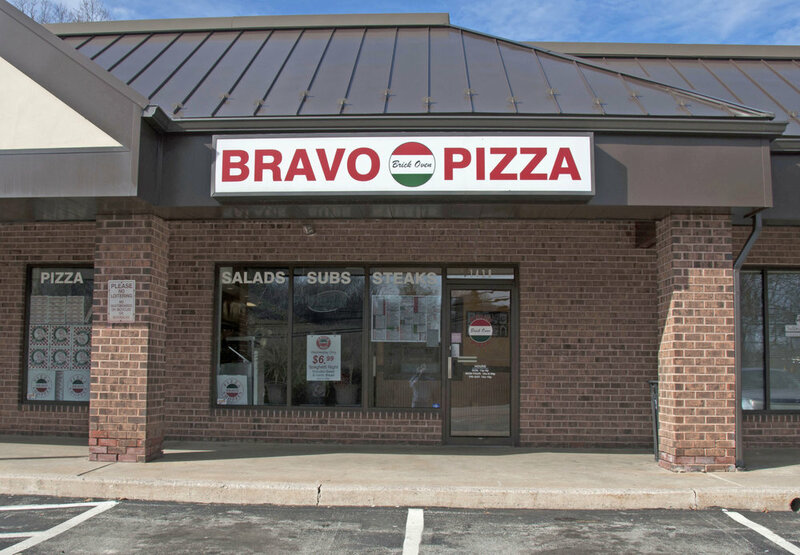 Bravo Pizza of West Chester serves delicious Pizza & Italian cuisine to West Chester, PA and the surrounding areas. Whether you are dining in our restaurant, picking up take-out or need catering for a party, we can accommodate! Our Pizza is made with our delicious fresh dough, topped with our own special recipe sauce and finished with fresh mozzarella cheese. Each pie is baked to perfection; you won’t find a fresher, better tasting pizza anywhere else. If you can imagine your perfect pizza….We Will Create It!! Bravo Pizza is BYOB and is known for more than just our wonderful pizza. We encourage you to try one of our signature pasta platters or sandwiches. All of our sandwiches are made to order with fresh and flavorful ingredients nestled in our signature bread. Our distinctive menu offerings also include a wide variety of Calzone, Pasta Dishes, Dinners, Steak Sandwiches, Hot Subs, Cold Subs, Melts, Burgers, Wraps, Panini’s, salads tossed to order, soups, wings, and delicious desserts. Bravo Pizza of West Chester is BYOB and our menu consists of wide variety of items including pizza, strombolis, pasta, hoagies, grinders, salads, burgers, sandwiches, steak sandwiches, desserts and more. Our Mussels Fra Diavolo special consists of mussels sauteed in a spicy homemade tomato and wine sauce. Our Rigatoni Sorrento special consists of chicken breast sauteed in a blush sauce over rigatoni pasta. Our Eggplant Rollatini special is prepared with breaded eggplant stuffed with creamy ricotta cheese topped with homemade tomato sauce and sprinkled with parmesan cheese, served with a side of spaghetti. 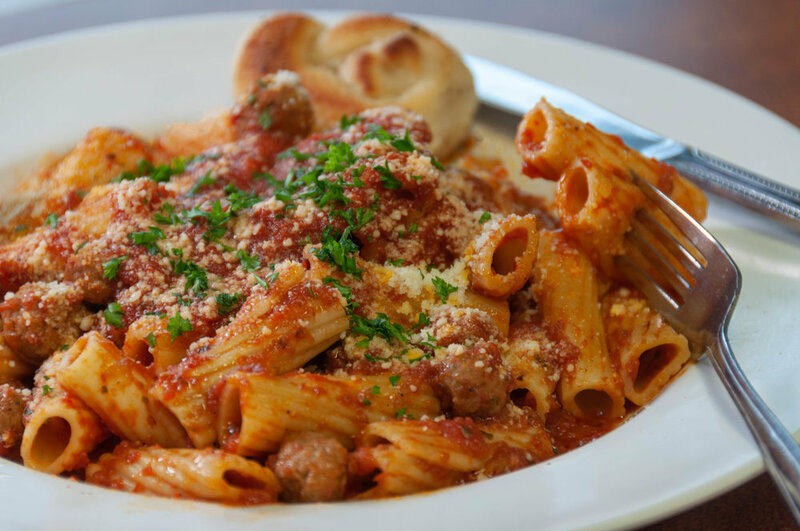 Our Penne Contodino dinner special consists of Penne Pasta topped with homemade tomato sauce with meatballs and sausage. Our Tuesday Night Veal Parmigiana Dinner Special consists of breaded Veal with mozzarella cheese, oven baked & served with a side of spaghetti topped with homemade tomato sauce. Our Ravioli Dinner Special consists of cheese filled Ravioli topped with homemade tomato sauce. Our Gnocchi dinner special consists of potato dumpling pasta in a homemade tomato sauce. Our Rigatoni A La Bravo special consists chicken sauteed with sun-dried tomato & broccoli in a white wine sauce over rigatoni pasta. Our Pasta Trio special consists of stuffed shells, manicotti & ravioli topped with homemade tomato sauce and mozzarella cheese & baked in the oven. Our Parma Chicken Special consists of breaded chicken breast topped with Parma prosciutto, ricotta cheese, mozzarella cheese & marinara sauce, oven baked & served with a side of spaghetti with homemade tomato sauce. 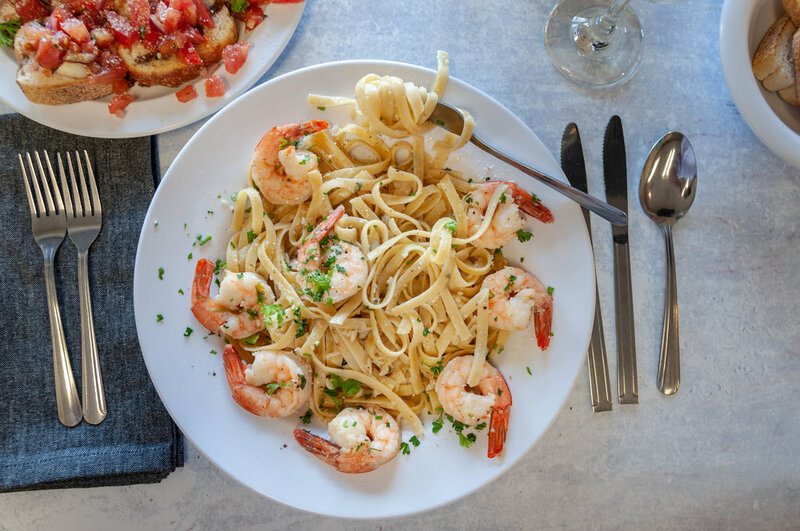 Our Shrimp Scampi Special consists of shrimp sauteed with garlic, butter, lemon & olive oil in a white wine sauce over fettuccine pasta. Our Lobster Ravioli Special consists of lobster stuffed ravioli sauteed in a Grand Marnier sauce. Our Fettuccine Alfredo Special consists of fettuccine pasta tossed in a creamy homemade Alfredo sauce. Our Penne Vodka Special consists of Penne pasta tossed in a creamy homemade vodka sauce. Our Chicken Marsala Special consists of chicken breast sauteed in a Marsala wine sauce served with a side of spaghetti. Our Spaghetti with Clam Sauce Special consists of spaghetti pasta with your choice of a red or white clam sauce. Our Chicken Bravo Special consists of chicken breast sauteed with fresh baby spinach in a lemon & butter sauce. Our Stuffed Rigatoni Special consists of over-sized rigatoni pasta stuffed with sun-dried tomato, mushroom and fresh spinach in a red wine sauce. Place your catering order now and leave the cooking to us! Bravo Pizza of West Chester offers a wide variety of entrees for all your catering needs. We accomadate both residential & commericial catering events! Specializing in Birthdays, Luncheons & Special occassions! Call & ask to speak with a catering coordinator for more information. See our catering Menu!